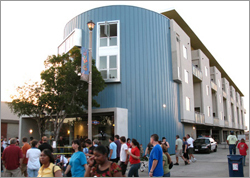 Two affordable housing projects, both in California, are the winners of the 2010 HUD Secretary's Housing and Community Design Award: Paseo Senter at Coyote Creek, in San José, earned the prize for excellence in affordable housing design, and Arbor Lofts in Lancaster received the award for creating community connection. The award, presented in conjunction with the American Institute of Architects, is emblematic of HUD's commitment to supporting sustainable communities to integrate housing and transportation and to improve the capacity for smart growth decision-making about land use and zoning. Both prize-winning projects incorporate elements of sustainable development, such as affordability, good design, mixed-uses, urban infill, and energy-efficiency. Affordable housing in San José is a pressing issue, according to Kristen Clements, Manager of Project Development in the city's Housing Department: nearly one-third of residents earn less than half the local median income of $68,167. In fact, based on her estimates, "minimum wage workers would need to work 138 hours a week," to afford fair-market rent on a two- bedroom home in the area. She says that city officials considered the location appropriate as an affordable housing development because a school and social services were located nearby. The proximity of Coyote Creek – the rivulet runs close to the development – was another plus, given that the Parks Department plans to integrate the watershed into the parks system. Equally important, Paseo Senter created a "place" in an area of San José that had once been disconnected from the rest of the city. To create Paseo Senter, the city of San José swapped land with a private landowner, who had been using the area as a hay farm, and stitched that together with parcels of unoccupied land it already controlled. CORE Affordable Housing then worked with Charities Housing to develop and fund the two-building, 218-unit development. To promote the project, San José's Housing Department made two separate loans – in the form of 55-year residual receipts – totaling $12.9 million; nearly $9 million in tax-exempt bonds provided additional funds. All told, Paseo Senter required financing from 12 different sources, including the California Department of Housing and Community Development Multifamily Housing Program and the Housing Trust of Santa Clara County, among others. 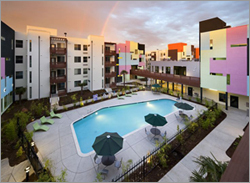 But what garnered Paseo Senter the award is its architecture, which responds to both the needs and constraints of affordable housing. The three-story, bold-colored buildings, completed in 2008 by San Francisco-based David Baker + Partners Architects, incorporate a number of design elements that create a sense of community. For instance, in terms of community amenities, the two buildings share a courtyard, an outdoor pool, and a workout room. The apartments are also designed to wrap around a parking garage, thereby maintaining an active street edge. As in classic urban mixed-use style, the street that runs between the buildings, designed for pedestrians, is lined with entry stoops. As a result, says Paul Ring, development manager for CORE Affordable Housing, it "has that retail feel." Such "retail" tenants include an American Indian education center, a daycare center, and a grandparent center for people caring for their grandchildren — tenants that respond to the particular needs presented by affordable housing. In addition, Paseo Senter is designed to exceed California's energy-efficiency standards by some 15 percent — savings that make a difference to the environment and to low-income residents. Of the 46 one-bedroom, 105 two-bedroom, and 67 three-bedroom apartments, 30 percent are earmarked for extremely-low-income residents and 70 percent for very-low-income; and the city has pledged a 55 year commitment to this level of affordability. Like many cities in the United States, downtown Lancaster, California had long been neglected. To revitalize the area, in 2001 the City Council and Agency Board passed the North Downtown Transit Village Project. Since then, tax credits, mortgage revenue, HOME funds, Section 108 loan guarantees, HUD Community Development Block Grants, and a Sustainable Communities Grant from the state of California have all contributed to restoring the heart of downtown, says Elizabeth Brubaker, Lancaster Director of Housing and Neighborhood Revitalization. Arbor Lofts, an infill development that opened in December 2009, was the catalyst for the city's Downtown Specific Plan, an initiative approved in September 2008 that calls for both housing and commercial urban infill development. Scott Ehrlich of Insite Development, the developer who conceived Arbor Lofts, points out that because rents are cheap, artists are often the first to initiate urban infill in a blighted neighborhood. Over time, restaurants, other cultural activity, and new residents follow suit with their own infill development. But as a neighborhood gentrifies and rents rise, artists — whom he calls "emerging pioneers" — are often forced out. Arbor Lofts will make it possible for artists to remain in downtown Lancaster, according to Ehrlich, as the neighborhood develops around them. At the same time, their very presence will help to spur a downtown revival. It's this very process — incorporating housing with other community amenities as a means of achieving revitalization — that earned Arbor Lofts its award for creating community connection. To design the units, PSL Architects' project principal Mark Lahmon consulted artists about what amenities they would find useful in a live/work space. Those discussions resulted in 21 two-story, four-bedroom apartments whose features include concrete floors, exhaust vents to expel chemicals, and 220-volt outlets to accommodate a kiln or welding equipment. At the same time, Arbor Lofts' energy-efficient design incorporates sustainable elements that diminish the use of fossil fuels and reduce water usage. As a result, the lofts exceed California's Title 24 Energy Code by some 20 percent, and its lighting system exceeds those requirements by 24 percent. Also included in the design is a storefront community space used as a gallery. That benefits the artists by giving them a free opportunity to promote their work, and provides Lancaster residents reasons to visit downtown. The gallery space has also served as the backdrop to farmers markets, a street fair, and other community uses. In that way, Arbor Lofts has proved vital to creating a downtown defined by mixed-use, mixed-income development. To promote Arbor Lofts, the city waived impact fees and assisted with land use entitlements–the process by which a city grants rights to a developer rights for new or expanded land uses. InSite waived its developer fee, and the project also received 9 percent Low Income Housing Tax Credits. To qualify for an apartment, would-be residents must earn at least 50 percent of their income by making art and, given Arbor Lofts' commitment to affordable housing, must have incomes at or below 60 percent of the area's median income. These projects demonstrate sustainable design elements that build community and cater to the needs and limitations of families in search of affordable housing. Building affordable, mixed-use spaces for artists is an innovative and forward thing strategy to revitalize downtown and jumpstart a sustainable, mixed-income and multi-use urban neighborhood.